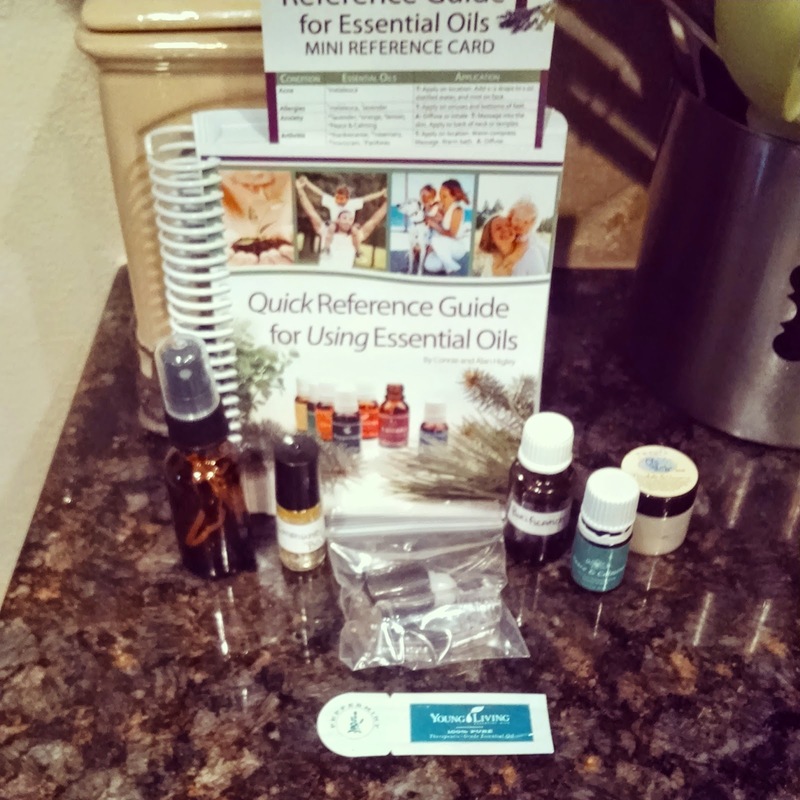 I got the Young Living Premium Starter kit to start. I also bought two other diffusers at GNC and a big bottle of both Purification and Thieves. 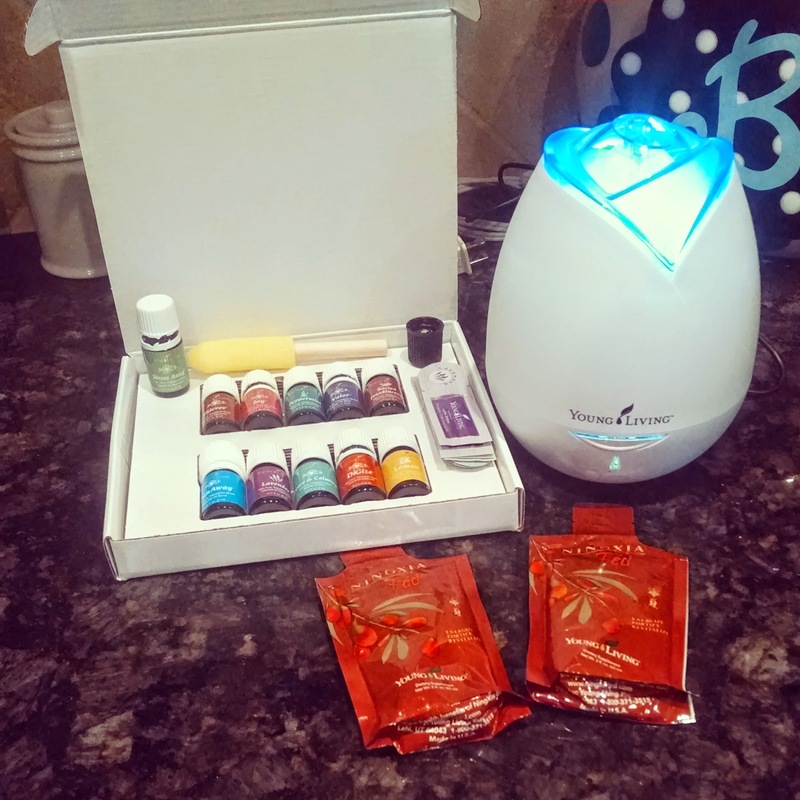 I have SO many friends who sell either YL or DT but I went with my friend who is local to me because she was so sweet and brought me tons or samples and let me borrow her diffuser when I was sick. I also got a guide and a bunch of other informational things. Let me start by saying that I am not using essential oils in place of medication. I am using them with medication and my family and I are not ingesting the oils... just because I haven't gotten to that point yet. Here are some of the things I've used them for. My favorite to diffuse is....The Allergy Trio: Lemon, Peppermint and Lavender. I have been diffusing that in my boys' rooms since allergy season struck and in our living room. I can definitely tell I've been coughing less and the boys seems to be less congested and snotty. 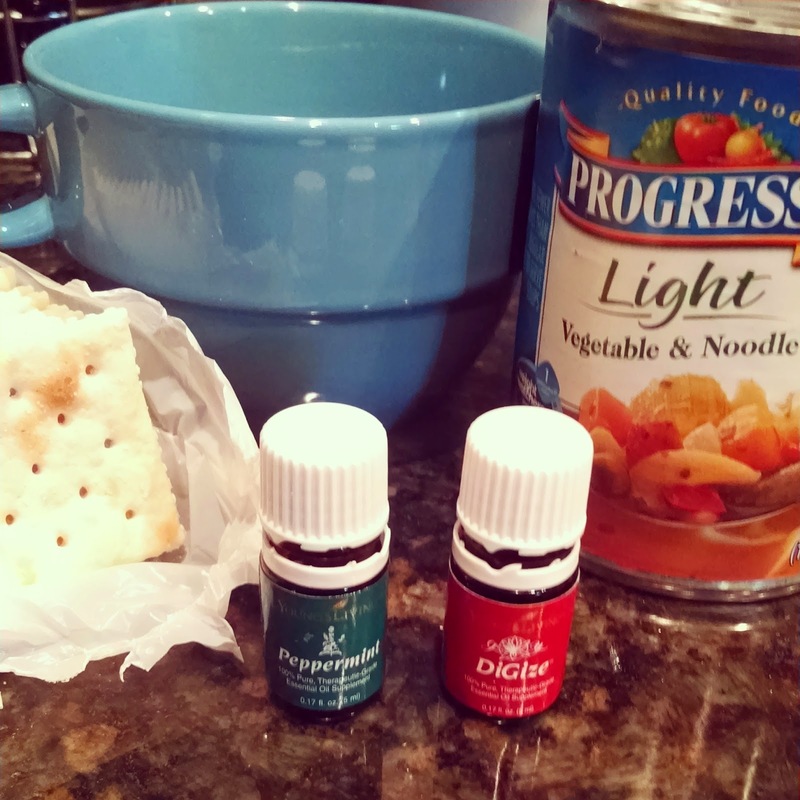 I had some tummy trouble last week and use Digize and Peppermint, I felt better about an hour after rubbing them on my stomach and diffusing the Peppermint. I have also done Joy, Stress Away and Peace and Calming in our living rooms in the evenings. I use Valor and Lemon at my desk. 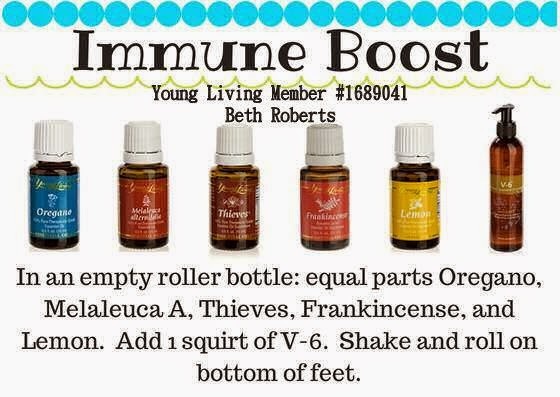 Beth made me an immunity booster roll on that I have been using on our feet.... and one of my favorite things so far is the Thieves cleaner that I made. I used Thieves and Purification on Rhett when he had HFM and he cleared up pretty quickly after starting them. I love the smell of Thieves and LOVE cleaning with it. 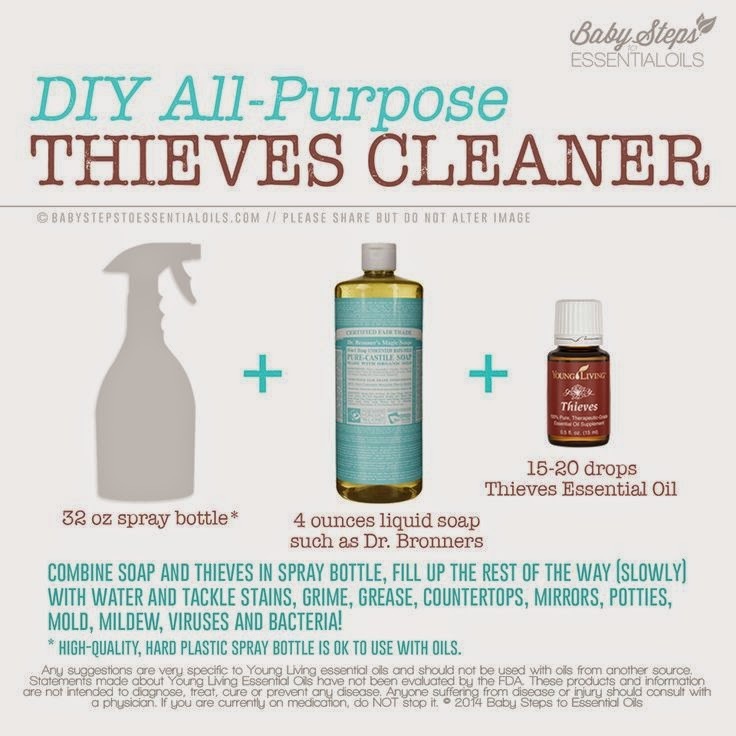 I know you can buy a concentrated cleaner but I found this recipe on Pinterest and love it so much! Last night Bryan was feeling anxious so I used Peace and Calming and Lavender on his temples and neck and he felt better in about 30 minutes. I also love Peace and Calming with some Epsom Salts in a nice hot bath! We smoked a brisket yesterday and had flies like crazy, I started diffusing Purification in my kitchen and got rid of them SO fast! Even Bryan noticed! Yay! And just for the first time this morning Bryan has been having sore muscles so I put some Panaway on him with Olive Oil... I'll have to update in a bit with the results. Soooooo.... that's my take on Young Living Essential Oils so far. I know there is SO much you can do with them and I am still learning. I'd love to hear your favorite "recipes" or ideas and if you're interested in buying a kit I'd love to hook you up with one of my "Oily" friend, Beth. 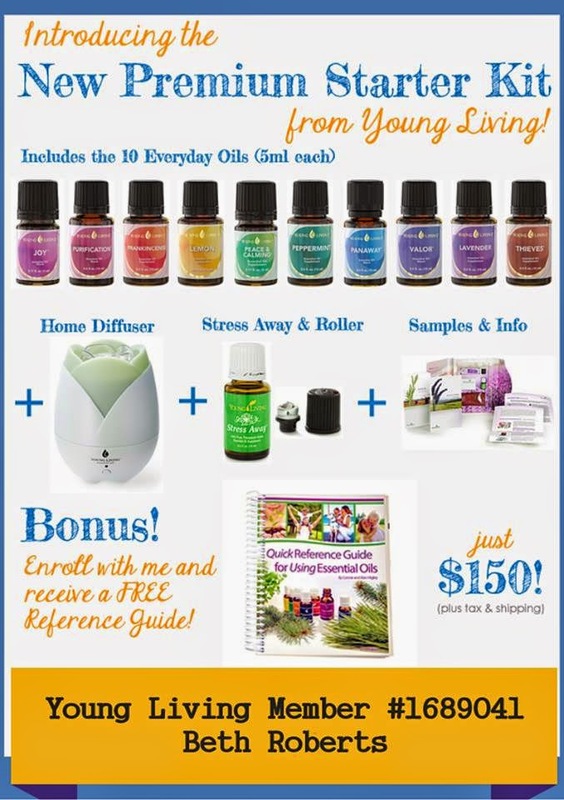 If you order through Beth and tell her you heard about YL from my blog, Beth is adding in a FREE Immune Boost Roll-On and Reference Guide! That's a HOT deal right there. Contact Beth by emailing her at tbmroberts@yahoo.com and make sure and tell her that I sent you. Or if you're friends with me on Facebook shoot me a message and I will get you hooked up with her. 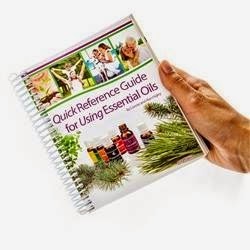 Beth will get you all set and add you to a private group all about using Essential Oils on Facebook!! !